One of the dishes developed by the Chefs of Meallmore. Preheat an oven to 170c. Line three half gastronome trays or sponge tins (20cm) line with baking paper/non-stick baking mats. Spray oil spray to prevent further sticking. Pour the cold milk into a bowl and add the CARTE D'OR Chocolate Mousse. Whisk with an electric mixer for 2 minutes at a low speed followed by 5minutes at high speed. Pour the cold milk into a bowl and add the CARTE D'OR Mango mousse. Whisk with an electric mixer for 2 minutes at a slow speed followed by 5 minutes at a high speed. Cut the sponge layers out to your desired size and shape. 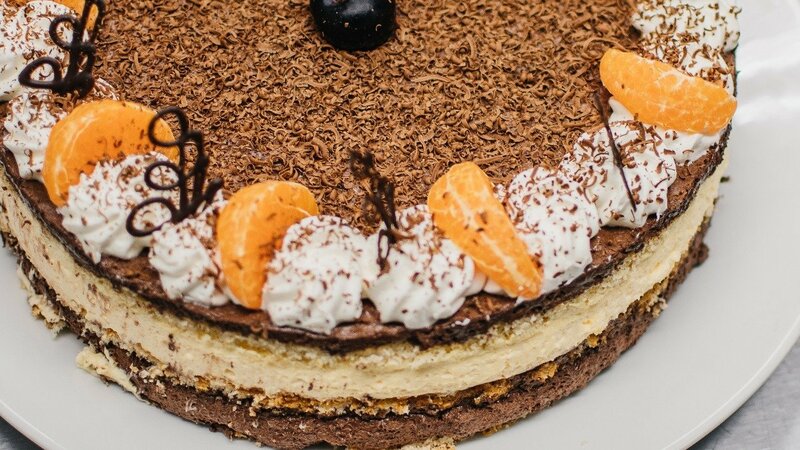 Place the first layer of the cake on a cake board and pipe a layer of CARTE D'OR Chocolate mousse. Place the second layer of the cake directly on top then pipe a layer of CARTE D'OR Mango mousse. Place the last layer on the cake then pipe on the remaining CARTE D'OR chocolate mousse level of the top with apalette knife. Place in the fridge for an hour to set up. Pipe the whipped cream into rosettes around the top of the gateau. Place the segments of mandarinon each of the rosettes.